The "tracks" on this page (above) are to enable you to purchase and immediately download sheet music for each individual song in this 24 song collection rather than purchasing the entire book and having it shipped to you in the mail. The entire songbook, which you can have shipped to you, is the most cost effective way to purchase the music for all 24 songs in this collection. 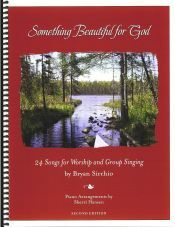 It includes full piano arrangements for each song, guitar lead sheets, guitar chord diagrams of all the chords I use, the lyrics with simple guitar chords written above the words, a description of each song and how it could be used in a worship service, and a "split track" CD that features the piano arrangement on the left side and the acoustic guitar accompaniment on the right side so that musicians can hear what the arrangements are supposed to sound like (there are no vocals on this piano/guitar CD). Over the years I've been asked a zillion times whether or not I have any music available for "contemporary worship" that would work well in traditional or so-called "mainline Protestant" churches. Many folks shared that while they wanted to bring more modern music into their worship services, they were having a very hard time finding songs in the world of "contemporary praise and worship music" that fit who they were theologically. You know - songs that would focus on making this world a better place, songs that would be inclusive in terms of language and God images, and songs that reflect an awareness of the traditions and "heart language" of mainline Protestant denominations. Well, this is my first attempt at providing a collection of songs in response to these many requests, and I hope and pray that there are many songs in this book which you and your congregation will love to sing together.